The Clinton presidential campaign has indicated that it will not support a carbon tax. But we simply cannot meet greenhouse gas reduction goals without a price on carbon. How can we take Secretary Clinton’s commitment to climate action seriously if she rejects carbon pricing outright? Clinton’s negligence in failing to support a carbon tax is simply inexcusable. Recent news accounts are full of success stories about new and improved renewable energy projects. However, despite those upbeat articles in news reports, the reality is deeply depressing, as renewable energy is still only about ten percent of our energy consumption, and the Department of Energy is predicting that fossil fuels will provide 75% of our energy even in 2040, a truly alarming statistic. If we go by the goal of stopping or reversing the concentration of lethal carbon dioxide and methane in the atmosphere, none of the 20 years of highly expensive, well-attended high-falutin’ meetings of the heads of states have slowed or stopped the growth of fossil fuel use. The meetings appear to have been a total waste of time. The climate in the Holocene (i.e., the most recent 10,000 years) has been relatively stable. For over 300,000 years, carbon dioxide (CO2) atmospheric concentrations didn’t exceed 300 ppm (parts per million). We learned that through proxy records – ice cores from Greenland and Antarctica, etc. From 1800 – 1900, global temperatures began to rise. Then, from 1900 – 2000, we noted an even warmer trend in temperatures in the 20th century. At the same time, CO2 concentrations climbed in a parallel manner. Scientists understood that as CO2 concentrations grew, the atmosphere would warm – that is basic physics. Today, instrumentation in the oceans, on land and in the atmosphere track the progression of global warming. That global warming is real is not debatable. In 1800 CO2 concentrations were roughly 280 ppm; today the concentrations are about 407 ppm – a 46% increase, and still rising. But 350 ppm is considered the maximum practical concentration of CO2, because CO2 concentrations over 350 ppm eventually produce very high atmospheric temperatures – temperatures which are not in the experience of modern humans. Modern humans have never lived or produced agricultural products in such a hot climate. Current global emissions have been growing steadily; a review of reported and planned activity by oil and gas producers predicts very large increases in the production of oil and gas, suggesting that even larger volumes will be burned in the near future. Human populations are increasing in the developing world, which means more emissions associated with more human settlement, oil and gas facilities, and expansion and modernization processes. Temperatures will rise in response to higher emissions, and temperatures will continue to rise far beyond a “safe zone” of 350 ppm. Carbon capture and storage, if it had worked, was imagined as a miracle process, which would have allowed us to burn carbon fuels without increasing CO2 emissions. But there have been no breakthroughs in the quest for successful CO2 removal/storage processes. Humanity does not know how to remove CO2 from the atmosphere and store it safely, but has spent untold fortunes trying. Disposing of CO2 by pumping it into voids in the earth conflicts with our understanding that the earth is not a secure long-term storage vessel; instead it is a leaky, imperfect “container” subject to enormous and varying tectonic forces producing earthquakes, eruptions and associated rifts in the earth’s upper layers. It is not safe storage, and any leaking CO2 leads to more warming. Hence, storage in the earth is a high risk undertaking, doomed to failure, and, like geo-engineering, it should be banned from the planet. In any case, major earthquakes are predicted – and are overdue – all along the US Pacific coast states. Scientists suggest that an upper limit for CO2 be set at or under 350 ppm. But global concentrations of CO2 are already much greater, at 407 ppm. Unfortunately, there is no way to bring the levels down to 350 ppm save by ceasing to burn any fossil fuels and then waiting for natural processes to correct our mistake. 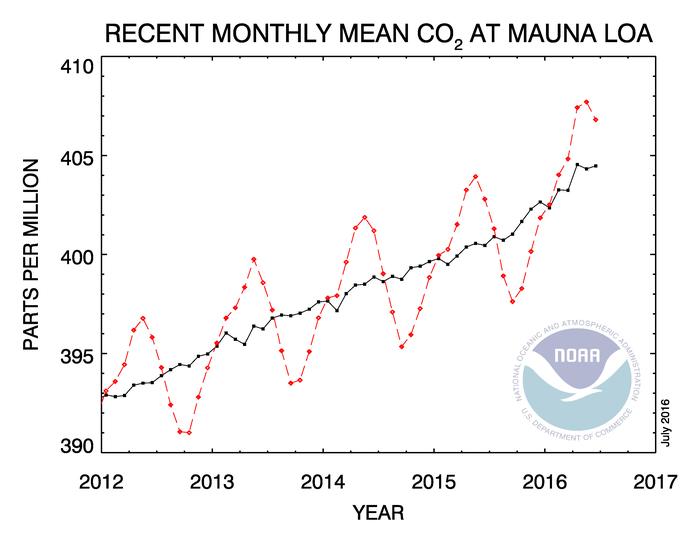 Going beyond the safe limit – 350 ppm – appears to have been a grave error. Emissions must end. Carbon taxes are taxes levied on CO2 emissions in order to offset damages caused by CO2. The major damage comes from the heating of the atmosphere. CO2 heats the atmospheric gases and radiates that heat, causing everything to be much warmer than it would be if there were no CO2. Taxing carbon fuels makes carbon fuels more expensive and entices operators to switch to non-fossil fuel energy systems. There is a radical disconnect between the reality of high levels of fossil fuel energy, on the one hand, enabling us to be highly mobile and to enjoy high levels of consumer goods; and, on the other hand, the reality that CO2 emissions from burning those fossil fuels are causing severe warming and related catastrophic effects. We ritually ignore the logic leading to the conclusion that burning carbon is a catastrophic, egregious error. To mollify our conscience, we observe token rituals (ride a bike to work once a week, buy a Prius, grow a garden, take the bus, etc.) that suggest that we know the ill effects of global warming and are doing something effective to mitigate them. We are simply ignoring the elephant in the room – fossil fuels. We continue to burn fossil fuels without much (or any) restraint. The answer is “YES”. We must quit creating CO2 at whatever price we must pay in effort, expense and foregone convenience. The key understanding here is that burning carbon fuels when concentrations are much greater than 350ppm is playing Russian roulette with the future of humankind.